PHILADELPHIA, PA – March 14, 2016 – Janney Montgomery Scott announced today the hiring of two senior professionals to join its Institutional Equities Sales & Trading organization. Vince Montesano and Stephen Yamane have both joined the firm as Managing Directors. 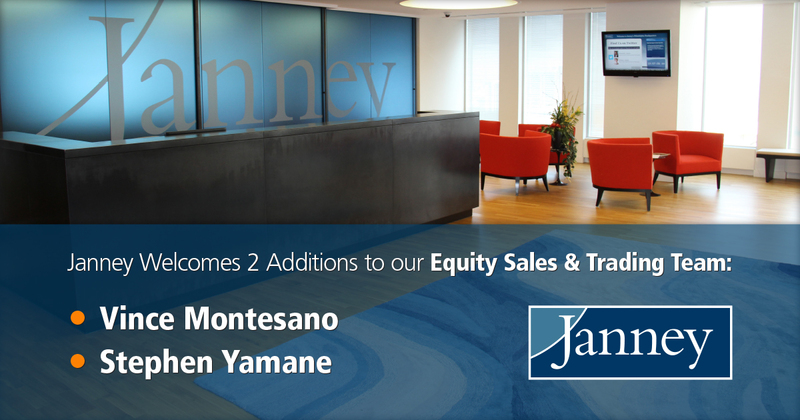 Mr. Montesano joins Janney’s Chicago office and brings 20 years of institutional sales experience to the firm. Vince spent the last nine years at JMP Securities, where he was a Managing Director and responsible for the Midwest region. Prior to JMP, Vince held senior sales roles at Leerink Swann and Lehman Brothers. Vince has an undergraduate degree from Villanova University and an MBA from Harvard Business School. “Our research product continues to be well suited for the Midwest institutional client, and Vince has the senior level relationships and sector expertise to continue our growth in that marketplace,” commented Andrew Maddaloni, Director of Research & Head of Institutional Equity Sales. Mr. Yamane has over 25 years of sales trading experience and joins Janney from FBR Capital Markets, where he spent the past four years. Previously, Mr. Yamane was a senior sales trader at Lazard Capital Markets, Piper Jaffray and Cowen & Co. Stephen has an undergraduate degree from the University of New Hampshire and will be based in Boston. “Stephen is a well-respected sales trader in the Boston institutional community with a number of long- term, strategically important accounts. He is a relationship-oriented professional who will fit well within our client-centric culture”, said Nick Lampone, Head of Trading and Sales Trading. Vince and Stephen both began their careers at Kidder, Peabody & Co.